It’s that time of year again in Australia – spring nesting season. Birds everywhere are making nests, sitting on eggs in nests or feeding young just out of the nest. In southern Australia – the region I am most familiar with – the “spring” nesting season stretches from the winter months of July and August, through the entire season of spring (September – November) and even well into summer (December – January). 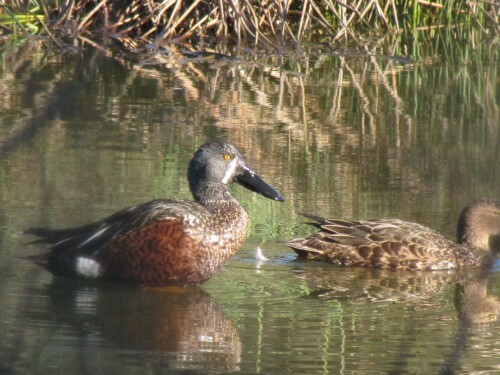 Most of the breeding occurs in the spring months. Some species – like our honeyeaters – will nest multiple times, raising 2 or more broods a season. Some species will even raise as many as five broods over a six month period. Willie Wagtail: our resident birds have been very quiet and I suspected that they had a nest somewhere but I only found it yesterday. It contained two eggs. 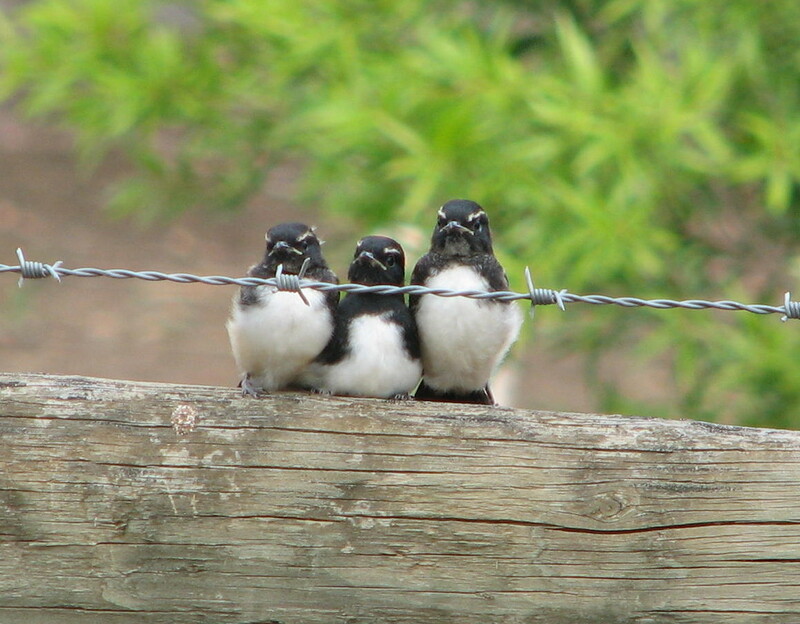 The photo above shows a fluffy family of Willie Wagtails just out of the nest a few years ago. New Holland Honeyeater: last week I saw two parent birds fussing over and feeding two fledglings just out of the nest and barely able to flutter, let alone fly. Red Wattlebird: I saw one bird sitting on a nest high in one of our trees but haven’t checked it in recent days. Other wattlebirds in our garden are being bossier than usual, so I guess that there are young around somewhere. House Sparrow (introduced species): they always seem to be mating and nesting, so nothing unusual there. Common Starling (introduced): the resident dozen or so birds all seem to have taken up occupation of a number of tree hollows in our mallee scrub, but I haven’t yet heard the persistent calls of the nestlings begging to be fed. Mallee Ringneck parrots: our resident birds were feeding young a month or so ago, and I have seen them constantly investigating a tree hollow. Earlier this week we saw two of them mating, so the next brood could be on the way soon. Cuckoos: I haven’t seen any cuckoos yet this season but I have heard Horsfield’s Bronze-cuckoos calling several times, so they could possibly be nesting too. Galah: I’m not sure what our Galahs are doing. They come to a hollow in an old growth mallee tree near our clothes line and enter the hollow every day but nothing else seems to be happening. This has happened now for several years so I will just have to keep an eye on proceedings. 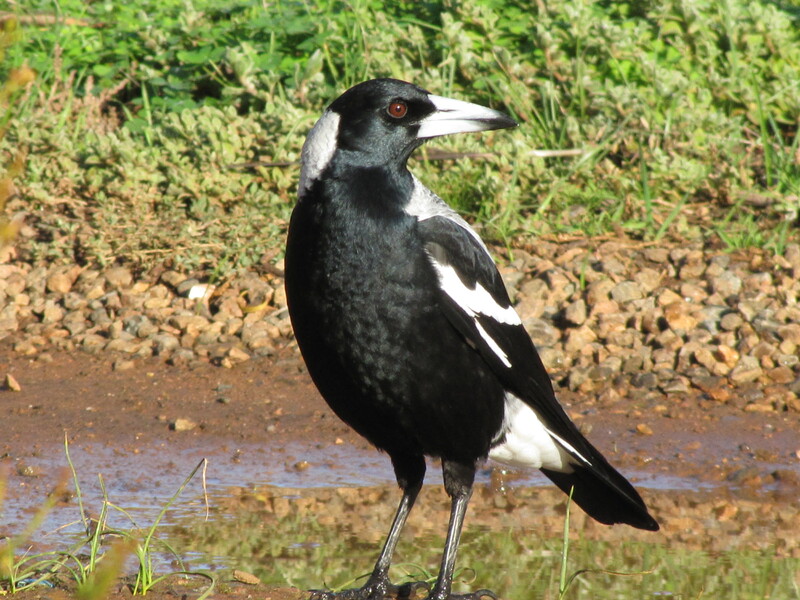 Australian Magpie: this is a really puzzling one. The resident magpies showed all the right activities a few months ago when they defended their territory but since then everything has gone quiet. We daily see several birds feeding around the garden and in the paddock, but I have yet to locate a nest. Very strange. Pacific Black Duck (they bring the ducklings to our swimming pool! Baby Magpie – this is the most popular article on this site with nearly 500 reader comments. Several months ago now I visited the Laratinga Wetlands for the morning. I have written a number of articles here over recent weeks about that visit, showing photos of the birds seen in most of those articles. These wetlands consist of about a dozen artificial ponds on the eastern edge of Mt Barker in the Adelaide Hills, South Australia. This are about a half hour drive south-east of Adelaide, as well as just over a half hour drive west from my home in Murray Bridge. The ponds are actually the sewage works and storm water drainage for the town of Mt Barker. The purified water is later recycled for irrigation on nearby farms. The wetlands are a wonderful haven for water birds, including ducks, cormorants, ibis, swamphens, coots, grebes, plovers, egrets, herons, reed-warblers and more. The surrounding landscaped picnic areas are also a haven for many bush birds such as honeyeaters, parrots, lorikeets, wrens, pigeons, bronzewings, hawks, kites, falcons, flycatchers and more. On this most recent visit I took several photos of a male and female Southern Shoveller. Several of these photos are marred by branches or twigs in the way and the only reasonable one is that shown above. 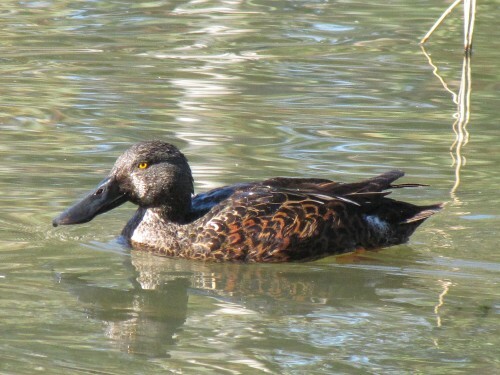 Also known as the Australasian Shoveller, this duck is found in suitable habitat throughout the eastern half of Australia, including Tasmania as well as south western parts of Western Australia. It is a species I have not seen all that often, and on those few occasions I have seen it, I usually only see a couple or a small group, never in large numbers. I have included another photo below. This is of an eclipse plumage bird and was taken last year in one of the wetland areas of the Western Plains Zoo at Dubbo, New South Wales. I was a little amused last week when there was quite a flurry of correspondence in the Letters to the Editor section of our state-wide newspaper, The Advertiser. 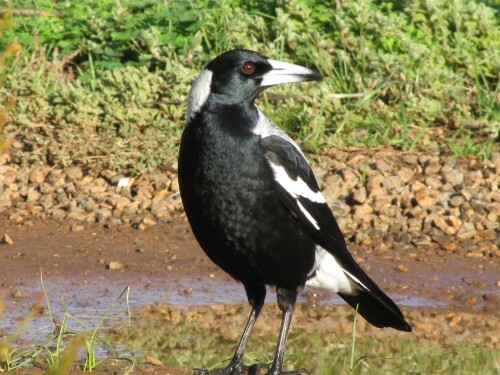 A reader wrote in complaining that something should be done about Myna birds in his suburb which he considered pests. He claimed that they were chasing away all the other birds, especially the smaller ones such at wrens and thornbills. The next day the paper printed a whole page of rebuttals – or rather, a raft of claims of mistaken identity. Several years ago I, too, experienced getting into a long discussion with someone who was adamant that there were Mynas around the Salisbury area in the north of the city. They just would not be convinced otherwise. 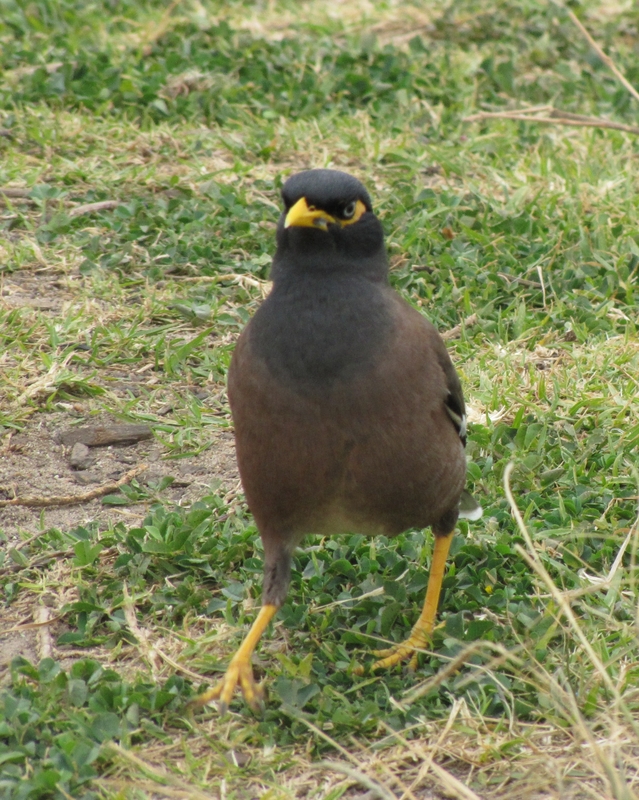 The fact remains that there are currently no Common Mynas (also known as Indian Mynas) in South Australia. This introduced species is, however, relatively common in the eastern states and their range is increasing. Only last week my 7yo grandson reported that they now have them in their garden in Artarmon for the first time. (I have seen them up the street but never in their garden.) I have included a photo of a Common Myna below, taken several years ago in the Taronga Park Zoo in Sydney, a few suburbs away from my son’s home. 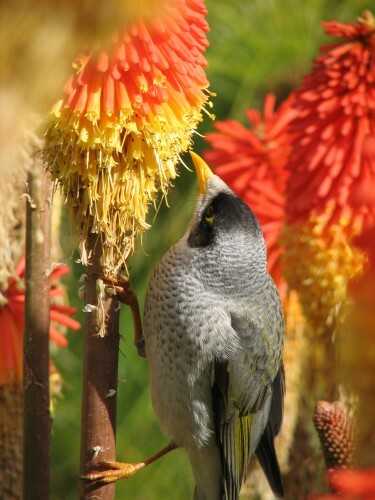 The species that the correspondent was concerned about was the Noisy Miner, an Australian native honeyeater species as shown in the photo above, taken a few years ago in the Adelaide Botanic Gardens. The Noisy Miner is a gregarious and mostly aggressive species which can be very dominant in some situations. Their bossy ways discourage smaller species like wrens, thornbills and other honeyeaters until those species leave and never return. One of the ways of combating their habits is to plant up gardens with smaller Australian native plants because they prefer more open, grassy, lawned areas. The species is listed by the IUCN (World Conservation Union) as one of 100 of the world’s worst invasive alien species alongside Common Starlings, Red Foxes and Cane Toads. 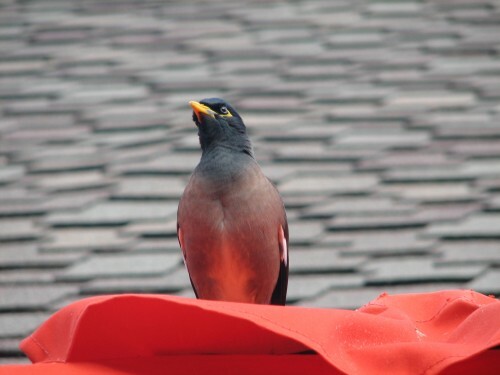 The Common Myna is a moderate pest of agriculture causing damage to orchard fruits such as fig, apple, pear, strawberry, guava, mango and grape. It also damages standing cereal crops including maize, wheat and rice. attacking terns on islands as well as taking the eggs of other sea birds, possibly interfering with those birds’ breeding and general behaviour. The Common Myna is also known to spread avian malaria to other birds. Website: Primary Industry and Regions South Australia – this page lists 6 PDF documents relating to potential pest bird species in South Australia: Common Myna, Canada Goose, Red-whiskered Bulbul, Common House Crow, Indian Ring-neck Parakeet and Barbary Dove. It also has other documents relating to potential animal pests such as the Cane Toad. It’s magpie swooping time again. At this time of year people in many places around Australia are ducking for cover. It is magpie swooping time again. Around July and onwards our Australian Magpies start building or refurbishing their nests ready for the breeding season. Once the female has laid to eggs she is the only one to hatch them. Meanwhile, the male keeps guard over his territory. This species is highly territorial and disputes over their patch are hotly contested. On our five acre (2 hectare) property we have three intersecting territories, so the conflict can sometimes get quite boisterous. Once nesting commences, these bird wars calm down. You could say that they are real life “angry birds”. The fighting doesn’t always end there, however. While the female is sitting on the eggs, or the young are being fed while still in the nest, the male can be very aggressive in guarding his territory against anything, or anyone, he sees as a threat to the success of his progeny. Animals – including dogs, cats, foxes – other birds, walkers, gardeners, joggers and anyone misguided enough to venture within a hundred metres or so of the nest are all fair targets. Cyclists are a particular object of attack. The male magpie will usually wait until the target has passed by, and will then attack from behind, a swift, smooth, nearly silent swoop aimed at the head. A swoosh of the wings and a few snaps of the beak from less than a metre behind is often the only warning one gets. By then it is too late. If contact is made the result can be both frightening and bloody. Their sharp beak can inflict a nasty break in the skin, and in a worst case scenario they have been known to damage an eye. So – what can one do to prevent getting swooped? I recently read this great list which was published here in South Australia in Weekend Plus: a digital magazine for seniors. “We do need to take care around them because they have sharp beaks and claws and if they make contact, they can draw blood. “The good news is that swooping season only lasts about six weeks, beginning when the eggs hatch and finishing when the young birds leave the nest. 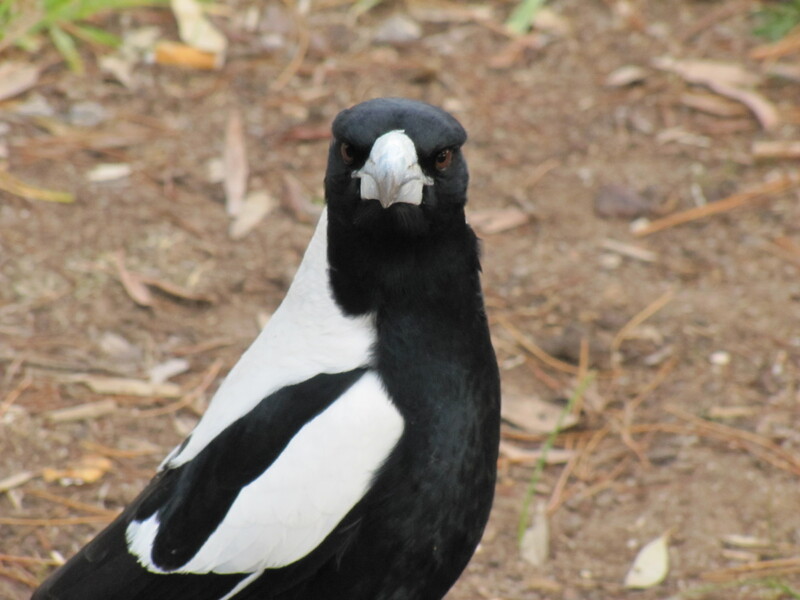 Avoid making eye contact with magpies. Walk, don’t run past their nests. Travel in groups where possible as swooping birds generally target individuals. Carry an open umbrella or wear sunglasses and a broad-brimmed hat. If you’re riding a bike, walk your bike through magpie territory or attach a flag to the back that is taller than your head. Don’t wave your arms or shout – this just proves you are a threat to the nest. 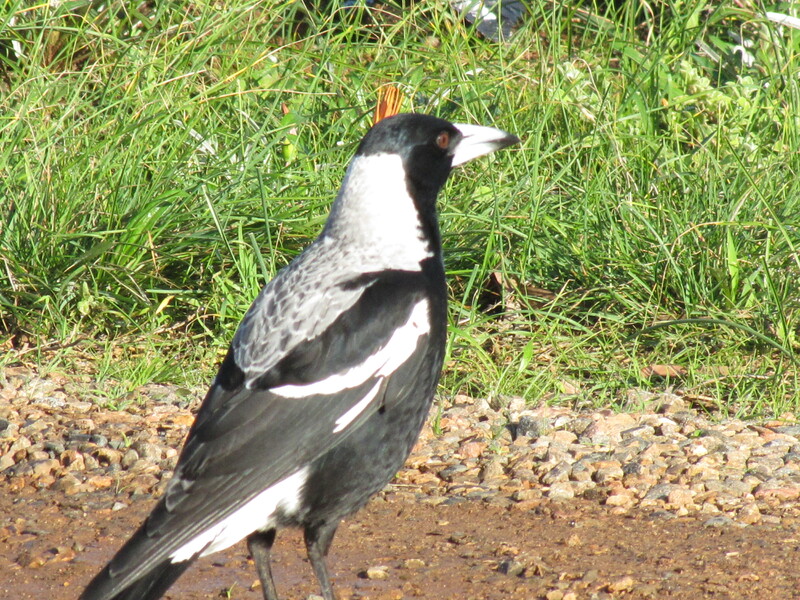 If you know of a swooping magpie, put up a sign to warn others. Do Blackbirds swoop? How to deal with aggressive birds. The Night Parrot has long been thought to be extinct. This has been the presumed status of the species for many decades. In fact, the majority of confirmed sightings were in the period 1870 to 1900. Since then, several dead birds have been found on roadsides and there have been tantalising reports of birders getting brief glimpses of the parrot in car headlights. The chance was always there; did it still exist in sustainable numbers – or any numbers at all? On our many travels I will often challenge my wife to be on the lookout for two species when travelling at night: the Plains Wanderer and the Night Parrot. Sightings of either species would be most unlikely and being a supportive and loving person she agrees to keep a sharp eye on the lookout. We always enjoy this verbal banter with a little laughter. However, the chances of seeing a Night Parrot have risen slightly in the last year or so. Ever so slightly. From 0% to approximately 0.001% – or thereabouts. Or to put it in Australian slang terms – from Buckley’s to Forget it! It is nocturnal – making it just that bit more difficult to observe. It’s preferred habitat in spinifex grasslands in the arid interior of Australia – that big space in the middle where very few travel and even fewer live, limiting chance sightings even further. It is small, green and yellow and dumpy, and runs and hops in preference to flying. It shelters in the clumps of the spinifex during the day making it almost impossible to find during the day – unless stepped on. Which you wouldn’t want to do to such a rare bird. It has never been filmed – until recently. Not much is known about the habits of the species, but that is about to change. After well over 17,000 hours of field work over the span of a decade, this species was rediscovered and filmed by John Young. In 2013 naturalist and wildlife photographer John Young captured several photos and a few seconds of video footage of a live bird in western Queensland. After a search spanning many years, John was finally rewarded by an incredibly close-up encounter with a Night Parrot – often considered the ‘holy grail’ for birdwatchers and naturalists. Global interest in the discovery was so intense that the exact location of this only known population remains a closely guarded secret to protect the birds from disturbance. Quoted from the Bush Heritage Australia website. What is interesting about the Bush Heritage article is the 3:34 minute video showing the bird and the habitat in which it lives, plus more information about efforts to conserve the area. There is also an appeal to raise money in this important conservation project. I am sorry that I do not have a photo of my own to share with you. My wife will just have to keep looking. Bush Heritage Australia – read more about this interesting bird, watch a short video and donate to the project to preserve the bird’s environment. Looking for a Night Parrot in a Haystack? A recent report in The Australian newspaper. You are currently browsing the Trevor's Birding blog archives for September, 2015.